Traditional farmhouse on Lot/Aveyron border with salt pool. Pets very welcome . Property 4: Traditional farmhouse on Lot/Aveyron border with salt pool. Pets very welcome . Property 6: Charming farmhouse in beautiful picturesque rural location. Property 10: Lovely 19th century limestone farmhouse with 5 bedrooms set in own land. 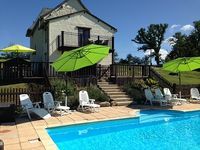 Gite Le Combal - Beautiful Farmhouse Near Najac, Panoramic Views, Heated Pool. Property 15: Gite Le Combal - Beautiful Farmhouse Near Najac, Panoramic Views, Heated Pool. Beautiful, luxurious farmhouse with magnificent views of the French countryside. Property 18: Beautiful, luxurious farmhouse with magnificent views of the French countryside. We stayed at the house with 3 families (6 kids). The house was nice and the airconditioning made the warm nights nice and cool. The saltwater pool was a favourite pastime for young and old(er).